This months challenge from Fresh from the oven is to make a Focaccia using which ever recipe we wanted to. Focaccia is becoming a staple in this house. 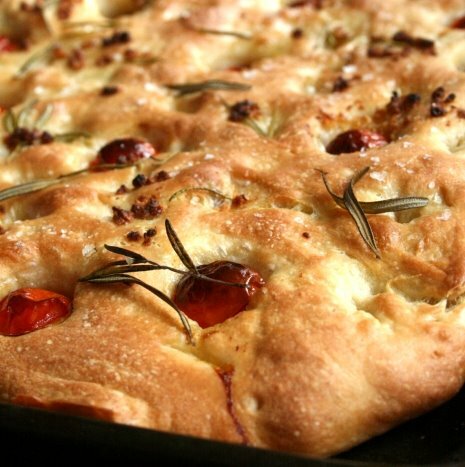 I probably make some version of focaccia more than any other type of bread. It’s perfect for barbecues or when we have people over to dinner because it is easy to share. I made this variant for my Birthday BBQ and it went down very well. The tomatoes give it a nice change in texture and sweetness. The only slight alteration I would make next time would be to add the garlic to the dough as it caught a bit on top when added to the oil. 1) Mix together the flour, yeast, salt and water. Once the ingredients are combined add the olive oil. Knead for around 10 min until the dough is smooth and silky. At the stage, if using a mixer, the bowl should be clean of dough. 2) Shape the dough into a round and leave to rise in a covered and greased bowl until it has nearly doubled in size. 3) Tip the dough out and work in a rough rectangle shape then place in an oiled baking tray. Cover and allow to rise for 20 min. 4) Preheat the oven to 250oc (or as high as it will go). When the bread has had its half hour rise prod it with your fingers to get the cratered texture then push the tomato halves into the dough. Drizzle with the garlicky olive oil then sprinkle with salt & rosemary. 5) Bake for 10 min then bake for a further 10min at 200oc. Leave to cool on a wire rack for around 10 min before serving.